Nobody really knows the origins of the Tarot. There are many people that think they originated in China or Asia and others that think they started in Europe. They are full of symbolism from folk lore, history and astrology. It is thought that they may have originated to tell the story of the gospels in pictures so that the illiterate could ‘read’ them. The cards in a Tarot deck are called arcana and it is interesting to note the meaning of this word is mystery. 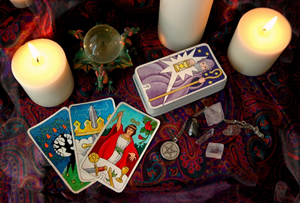 There are many different ways of reading the Tarot. In fact as many different ways as there are Tarot Readers! I believe that by looking at the past and present we can identify the paths available for the future. It is a really good way of assessing where you are in your life now and how the experiences of the past can help you to create your future. There is often help with the interpretation of the cards from passed loved ones during the reading! The guidance for these readings comes from a higher vibrational source and the information given is inspirational and directed at the life path and soul development of the client. This means that during the reading there are no predictions, but probable outcomes, as everyone has the power to create their own reality that changes as life unfolds. They are more about empowerment to create and manifest your heart’s desire and align your soul self with your physical self and live a joyous and fulfilled life. This type of reading takes about an hour and costs £35. To book an Reading please call me, Sally Wathen, on: 0115 973 2695 or Click Here to send me a message.